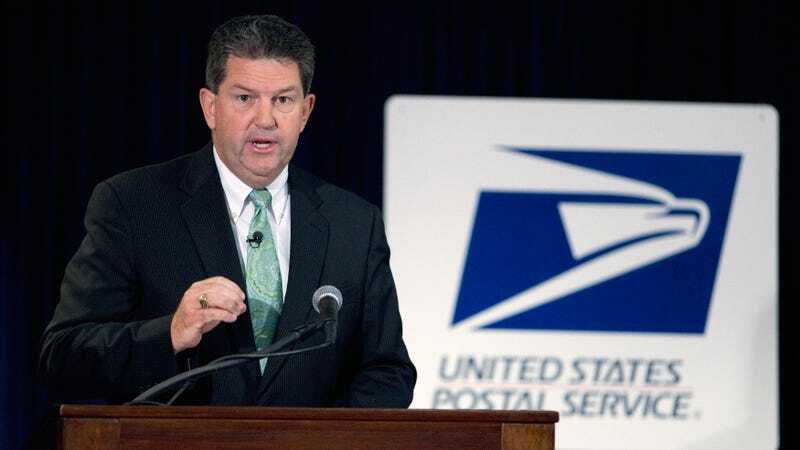 Patrick Donahoe worked with the United States Postal Service for a total of 39 years until his retirement in February of 2015, serving the final four-and-change years of his career as Postmaster General. He knows the agency inside and out, and—shocker—he told UBS analysts today that Amazon is profitable for the USPS, contrary to the president’s recent assertions. Marketwatch reports that Donahoe unequivocally described Amazon as profitable for the USPS. As a “competitive product”—i.e. separate from the regular mail pricing we use to send wedding invitations and dark-net drugs—Amazon would be paying for all the operating costs associated with its use of the agency’s resources, as well as 5.5 percent of USPS’s institutional costs. Again, this is coming from someone who worked there for nearly four decades. On the other hand, Trump tweeted Monday: “Only fools, or worse, are saying that our money losing Post Office makes money with Amazon.” So believe whoever, I guess. For the record, a USPS spokesperson declined to comment. Granted, some of Trump’s assertions about Amazon are right, if only by accident. Amazon’s business can have serious negative effects on taxpayers, both because of its impact on local businesses and its uncanny ability to court state and local subsidies and incentives. And for all the help Bezos received to tip the scales in his favor, Amazon effectively paid the federal government zero dollars in taxes for 2017. The fronts on which Amazon engages in aggressive, anti-competitive tactics that could be damaging to average Americans are many; the reasons you should feel bad for the world’s richest man over a Trump tantrum are few. More importantly, this whole Post Office spat is bluster from a president who doesn’t know how his own agencies work, and a very poor piece of political theater meant to disguise what’s believed to be his actual grudge another Bezos business, The Washington Post, for predictable reasons: how he’s covered by the media. Earlier this week, Martin Baron, the Post’s editor, reaffirmed that Bezos has no editorial involvement in the paper’s coverage. And to restate, in case it got lost in the usual maze of non-issues surrounding every Trump controversy, the Post Office isn’t getting a raw deal from Amazon. Our president is just a clueless, doddering old man with a well-founded inferiority complex, yelling at clouds. All that said, we’d love to know more about what goes on inside Amazon. Do you have a tip? Send us an email, or get in touch confidentially through SecureDrop.